The African continent continues to baffle the rest of the world. It is generally portrayed as the poorest, the most disorganised and the most conflict-ridden. But the rest of the world does not want to leave Africa alone to mend its ways. The reason is that, despite these apparent blights on the African landscape, the continent is grudgingly acknowledged as the richest in the world, in terms of natural and human resources. This, though, appears to have been lost on Africans themselves. Not so, the rest of the world. This is what Guy Arnold’s book has gone out to show. Just as there was a Scramble for Africa in the 19th century, Arnold says that there is a new one going on in the 21st century. How right, he is. And it is not just the usual suspects – the former colonial powers and the US – who are snooping around Africa these days cutting deals here and there. They have been joined by China and India and, to a lesser extent, oil-rich Gulf States. 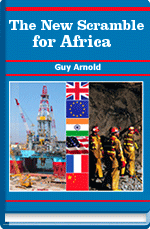 Arnold notes the inconsistencies in foreign policy in this unseemly haste for Africa’s natural resources. For example, while the US has been lambasting Robert Mugabe’s government in Zimbabwe for its human rights violations; and condemning China for not stressing the importance of respect for human rights in African countries where it is doing business, Washington is hobnobbing with an unreconstructed dictator in the person of President Teodoro Obiang of Equatorial Guinea. The county is an oil producer while Zimbabwe is not. “Oil invites corruption and it’s a two-way affair,” notes Arnold. There are other natural resources, such as coltan that is used for making mobile phones. This is in abundance in the Democratic Republic of Congo, which is constantly at war with itself. It is in this atmosphere that Western companies operate in the country – extracting natural resources with impunity from both government and rebel-held areas. Clearly, in this new scramble for Africa, Western companies would like to see more chaos on the continent because that is how they make their profits. A weak government is not in a position to enforce laws to curb the activities of these companies. Given the weakness of some of these governments, Arnold suggests that the African Union “should create a mechanism of its own to control incoming transnational corporations by laying down the parameters within which they must work in developing countries…” This makes sense. The New Scramble for Africa is an interesting read. It shows that if Africans can stop tearing their countries apart, they will be in a much better position to benefit from their natural resources. Indeed, the original Scramble for Africa succeeded because the continent was weak and divided.